Last Monday and Tuesday I spent all day volunteering for a local high school’s back to school registration. Part of my job was to invite the 1600 students and their parents to sign a thank you card (on a poster board) for the teachers. Tuesday night after registration was over, I looked over the four poster boards and began reading the thank yous. Suddenly my eyes welled up with tears as I realized the difference the staff was making in the lives of the students. Suddenly I realized that many of the school staff had chosen their profession to make a difference. All of us are wired to make a difference. Everyone wants a funeral with lots of people standing up telling stories about the difference we made in their lives. I’m wired that way too. In today’s reading, you’ll learn about what it takes to make a difference. Nehemiah 7:73-10:39. With the completion of the wall, the people now gather to listen to the reading of the Law (perhaps Leviticus and/or Deuteronomy). The people were religious, but they weren’t acquainted with the sacred book upon which their faith rested. Ezra not only responded at once to the people’s request (8:2), but he chose to do so not in the temple courts, but in an easily accessible place (8:3) and in full view (8:4) so that none should be barred from attending. Moreover, he chose to associate lay people with him in the enterprise (8:4). It seems that he was anxious to avoid any impression that the law was the private preserve of the religious professional. As the people listened, they began to weep because they understood the extent of their transgressions. Yet Nehemiah tells them to celebrate “for the joy of the Lord is your strength” (Nehemiah 9:10). The people grieved their sins, but Nehemiah reminded them that they were forgiven. They should celebrate the love and grace of God. Psalm 33:12-34:10. A theme we read in Scripture over and over again (could God be trying to drive home a point?) is the importance of trusting in God. Trust is just another word for “faith.” In Psalm 33, the psalmist describes the futility of trusting in armies and horses. Instead, he writes, “The eyes of the Lord are on those who fear him, on those whose hope is in his unfailing love, to deliver them from death and keep them alive in famine” (Psalm 33:18–19). To say that “The eyes of the Lord are on those who fear him” means that God acutely understands the needs of those who fear him, and is ready to respond. I can’t make a formula out of it, but God responds to our acts of trust in him. And what did trust in God look like to David? Read Psalm 34. While hiding from Saul may not seem to indicate trust in God, the fact that David kept his heart soft toward God tells us that he trusted that God was in control—in the midst of a very embarrassing season of his life. Every two years the city of Corinth hosted a series of athletic games similar to the Olympics. In fact, the Isthmian Games in Corinth were second in popularity to the Olympics in Athens. Whereas a wild olive branch was given to the winner in Athens, a pine garland was given to the winner in Corinth. Paul wrote that everyone competes in the race, presumably in the bi-annual Isthmian Games, but only one person wins the prize. “Run in such a way,” he exhorts his readers, “as to get the prize” (1 Corinthians 9:24). What is the prize? The crown that will last forever—something that a pine garland can’t offer. It’s eternal life, but the context tells me that the crown is embedded with gems that represent the difference we’ve made in the lives of others, especially for the gospel. And how are we to run? Paul uses the word “slave” twice in 1 Corinthians 9. He writes, “I beat my body and make it my slave” (verse 27). In other words, the healthy, disciplined life prevents us from being disqualified. It’s the life of holiness and self-discipline. Keeping our passions under control. But then he makes another interesting statement: “Though I am free and belong to no man, I make myself a slave to everyone, to win as many as possible” (1 Corinthians 9:19 italics added). Years ago, I enrolled in a video course taught by motivational speaker Zig Ziglar. He said something that I’ll never forget: “In order to get what you want, you need to help everyone else get what they want.” Sounds like making myself a slave. When we serve people, we earn the right to be heard. It gives us credibility. 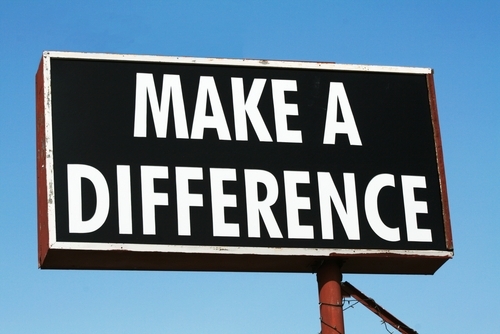 If you want to make a difference, serve the people around you. Make yourself a slave to everyone. Help them paint their house. Drive them to the doctor. Volunteer at school events. On the night Jesus was betrayed, John makes an interesting observation: “Having loved his own who were in the world, [Jesus] now showed them the full extent of his love” (John 13:1). The full extent of his love looked like a cross, but immediately after these words, Jesus washed the disciples feet. When we make ourselves a slave to everyone, we begin to look like Jesus. And we also begin to make a difference in our world. Describe a time when someone served you. How did it feel? What difference did it make in your life? How might God be calling you to make yourself a slave to everyone? Michael co-pastors The Neighborhood Church with Eugene Scott in Littleton, Colorado.